AMD has formally announced its "Juniper" HD 5770 and 5750 graphics which will put DirectX 11 cards firmly within the reach of mainstream consumers. Why? Just look at these prices. AMD says that Overclockers UK will be retailing ATI Radeon HD 5770 cards from Sapphire and Powercolor at £132 and £128 respectively. 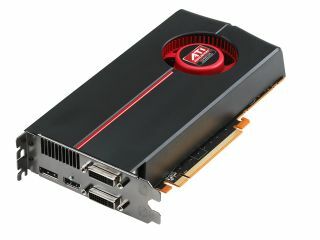 All ATI Radeon 5750 cards will be available for £110. But we're certainly paying a little more than our US counterparts. AMD's cited pricing showed the ATI Radeon HD 5750 512MB variant as low as $109 (£70) with the 1GB HD 5750 under $129 (£82). The HD 5750 came in at $159 – almost dead on £100. The new cards follow hot on the heels of last month's high-end HD 5870 and 5850 announcements also manufactured using 40nm process technology. We liked the HD 5870 a lot for its performance and relatively modest power consumption but criticised its slightly high pricing, mostly because Nvidia isn't yet on the scene with DirectX 11 hardware. The new cards represent far better value, while expect AMD to discount the 4870 and 4890 hardware in the light of these new arrivals – now could be the time to pick up a bargain especially as Nvidia will have to discount heavily to stay in the game. The 5770 and 5750 offer many of the same features as the higher end cards including ATI's Eyefinity multi-display tech, ATI Stream and GDDR5 memory as well as dual DVI, DisplayPort and HDMI. So what are the key specs? The HD 5770 has 800 stream processors resulting in more than 1 Teraflop of compute power and is clocked at 850 MHz. There's 1GB of memory on board clocked at 1,200 MHz. Once again AMD has worked hard to reduce the idle power load which is down to 18W though it's still 108W when fully loaded. The card can drive up to three 2,560x1,600 displays. The cheaper HD 5750 is only marginally different – clocked at 700 MHz, 720 stream processors. And with either 1GB or 512MB of GDDR5 1150MHz.